Add a fun, practical, tropical flavor to your home with our Burnt Bamboo Shoji screen room divider. Crafted from tough, lightweight, kiln dried bamboo pole and split bamboo pole slats. The bamboo slats are stitched tight, so the shade provides privacy. 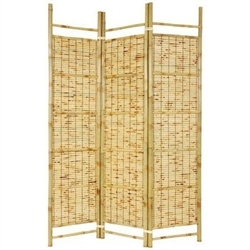 Please note, splitting in kiln dried bamboo poles can occur naturally and does not affect the structure of the screen, giving the screen a rustic look. Each panel measures approx. 72" tall x 17" wide x 1 ¼" thick. 3 panel screen (as shown) measures approx. 53" wide flat, approx. 45" wide slightly folded to stand upright.